The first step is to set aside a regular time each day. Choose a quiet place. Start by making a commitment to pray at least one prayer a week with your child. Next, select a simple prayer-time to teach your child using this NEW Brainstorming method. You are encouraged to start with a bedtime prayer as the child lay in bed at night, a mealtime prayer before you sit down to eat, or a morning prayer when you wake up your child. These easy prayers can be found in Daily and All Purpose Prayers in Book 1&2. Start as young as old as 3 to 12 years old. Now skim the prayer ahead of time to get the main idea, then put Prayers from the Heart in front of you and read as you go. 1. Begin by telling your child now is a good time to pray. 2. The Brainstorming Together step is next. Explain that the two of you are going to think about some things to share with God. Then ask one of the several questions that are provided. Remember to pause to let your child to think, then praise your child/preteen’s ideas. 3. Next, ask your child to share their thoughts with God. 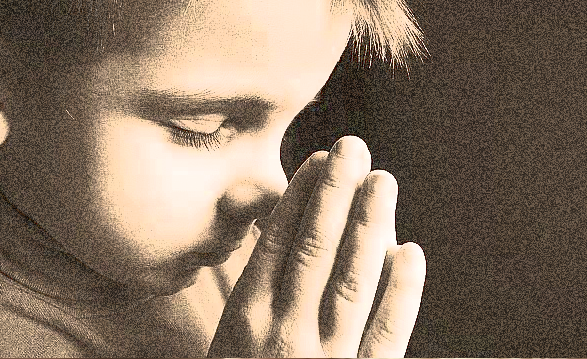 Start the prayer by asking your child to hold their hands in a prayer position. Ask your child how they want to greet God. You can suggest several greetings such as ” Hi God”, “Almighty God”, “Dear God”, or another greeting. Be prepared for a very short, simple prayer. NOTE: At first you may have to pray a very short, simple prayer using the child’s ideas. 4. Finally, reassure your child that God heard his or her prayer. Get started now. Find one of the easy prayers. Pray this prayer with your child. Keep the entire prayer-time brief (2-4 minutes). Taking time each day is more important than completing a prayer. Eventually your child’s attention span will lengthen and you will become more comfortable with this new method of teaching your child to pray. Prayers from the Heart offers specifically designed support tools for parents and teachers. The first support is a detailed table of contents. The second support is the “Bible Nuggets”. Every prayer-time includes four Bible verses that support the prayer. These are designed to help the student pray God’s Word. At the end of each prayer these “Bible Nuggets” are printed on a separate page that can be photo copied and cut apart for the child to post or carry with them to remind them what God wants them to do. The third support is the “Help” section. This information supplies you ideas about how to answer your students if they wonder why God has not answered a prayer in the way they expected. The forth support is the “Growing with God Incentive Chart”. This record keeping chart can be marked or filled in after each child says a prayer. This encourages your students’ desire to pray. Reward your students by having him/her put a sticker on Chart I or Chart II each time they complete a prayer. The fifth support is a list of the “Christian Traits” developed by using Prayers from the Heart. This list of characteristics will help you decide long term goals for your students. The sixth support is the “How Do You Feel?” charts. These charts help your students’ identify their feelings. For younger children there are a group of faces displaying different emotions. For older children/preteens there is a list of Positive Emotions and a list of Difficult Emotions.